Wyandotte, Mich., native and former University of Michigan player Justin Hicks is the lone golfer with Michigan roots qualifying for the U.S. Open at Congressional CC in Bethesda, MD. At the Columbus, OH, 36-hole sectional qualifier, Hicks fired 69-66-135 to finish T-4 and grab one of the coveted 16 spots to make it into the Open. 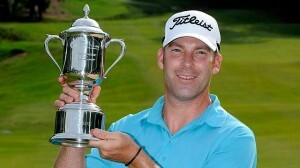 In a heartbreaker, Flint native Jeff Roth lost in a playoff at the Glendale, CA, sectional for its final qualifying spot. After missing a par putt on his last and 36th hole, Roth went into a playoff with three other players for one remaining spot. Repeatedly playing the par-three 16th hole in the playoff, it finally got down to Roth and LA pro Brian Locke. Locke secured the final spot by making a 10-foot birdie putt. As the first alternate, Roth could get into the Open next week if one of those five Glendale qualifiers withdraws in time for Roth to make it to Congressional–which is problematic seeing Roth is a head pro now in New Mexico. Incidentally, three amateurs qualified at Glendale including 16-year-old sophomore Beau Hossler Jr. and Steven Irwin, Hale’s son. You can “google” Bill Dwyre’s fine story on the sectional in the Los Angeles Times. Another near miss was Muskegon’s Andrew Ruthkowski (71-67) who fell two shots shy of making it into a playoff for a final spot at St Charles CC in Illinois. At that same sectional and also not qualifying were Matt Pesta, Commerce Twp., (71-71) and Flint’s Willie Mack III (71-72). Other Michigan players not advancing out of various sectionals around the U.S were: Brian Stuard, Jackson, (68-75); Joseph Juszczyk, Dearborn Hts., (77-66); Dan Olsen, East Lansing, (73-71); Martin Jeppesen (a), Ypsilanti, (71-74); Matthew Harmon, Grand Rapids, (71-74); Payne Gniewek (a), Trenton, (71-72); and U-M’s Lion Kim (72-WD). For the U.S. Women’s Open sectional qualifying, no Michigan player made it into the field at The Broadmoor in Colorado next month. But Rochester Hills amateur Amy Meier (148) is the second alternate out of the Wilmette, IL, sectional. Also the USGA reported that at age 12, Mariel Galdiano, of Pearl City, Hawaii, will be the youngest player in the U.S. Women’s Open field. Earning medalist honors at the sectional qualifier at Poipu Bay Golf Club in Koloa, Hawaii, Galdiano is the third-youngest qualifier in Women’s Open history, at 12 years, 11 months and 3 days old. On the other end of the age spectrum, Betsy King, 55, will be the oldest competitor in the field after qualifying in Mesa, AZ, with a 143 total. Twice an Open winner, King won the 1989 U.S. Women’s Open at Indianwood G & CC’s Old Course in Lake Orion, Michigan.